Tis the season of all things cozy! I’m paving way in my closet for all of my bulky sweaters, knits and turtlenecks! I just love all the layers that come with this time of year. 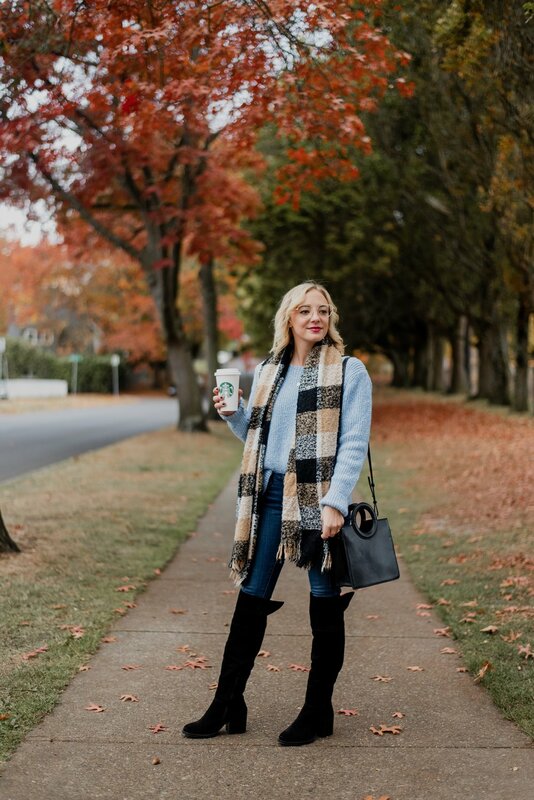 Today I am sharing with you one of my go-to winter outfit formulas that provides you with an outfit that is a stylish success for work and weekends! 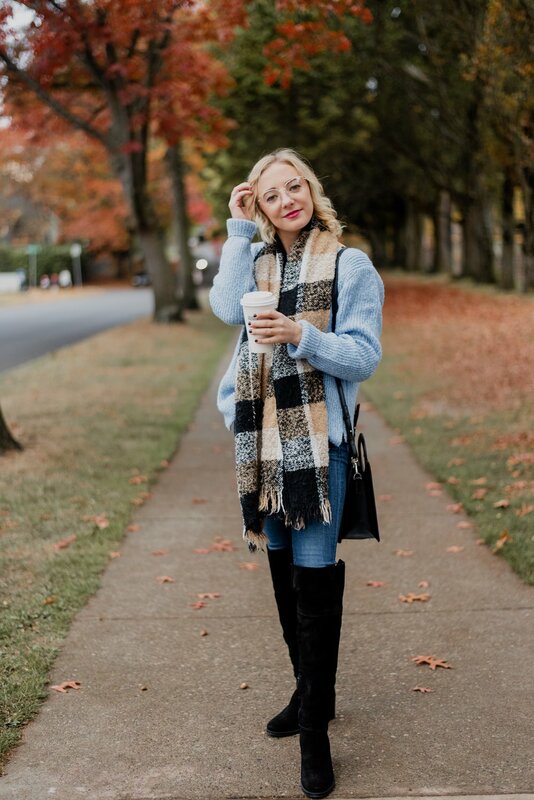 ﻿SWEATER + DENIM + OTK (over the knee) BOOTS + ACCESSORIES. Oh, and maybe a coffee for those busy weekdays! 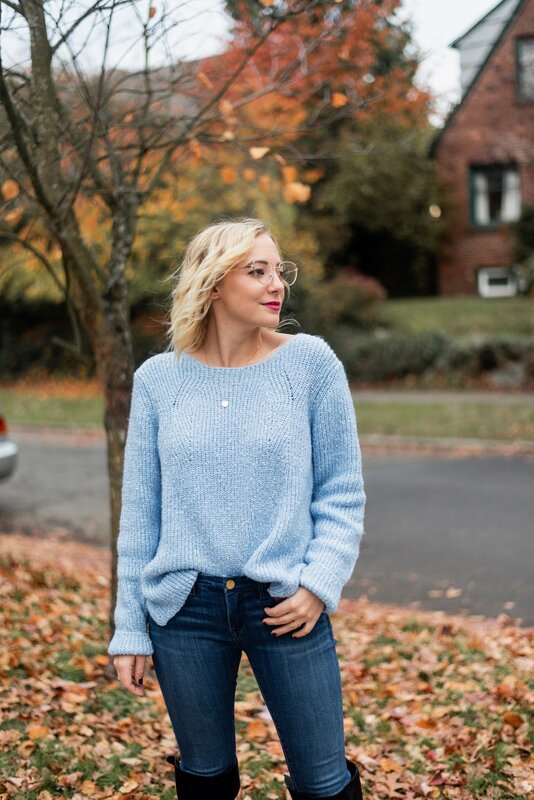 I am LOVING this sky blue sweater from Lane 201. It’s cozy and a bit oversized in fit so it’s great for layering over the top of leggings or tucking into a pair of jeans. I’m also re-embracing the color blue now that I’ve gone back to my natural blonde hair color and I have to say, I’m loving this color for winter! While the sweater is no longer on sale on the Lane 201 website, you can shop similar styles here | here | here | and here. I wear my jeans year round! Especially this pair of skinnies from PAIGE. I just LOVE the fit of these jeans. The darker wash is acceptable for work, date night or when I’m on the go during the weekend. This is always a trend that makes a come back in the winter and I’m SO glad! It means I get to make some use out of my Steve Madden OTK black boots. I enjoy wearing these boots with denim, leggings or a mini skirt. They immediately elevate any outfit given the style and block heel. Because I’m 5’2, it can take me a while to find OTK boots that are a good fit and don’t make me appear shorter than I already am. My biggest recommendation when picking out a pair of OTK boots: TRY THEM ON IN PERSON! Let’s talk cold-weather (and just plain fun) accessories! I have two bins full of scarves at home that I try my best to go through during the fall and winter months. I prefer bulkier scarves that don’t tend to be a good fit for the spring and summer months (for obvious reasons!) While I have variations of colors, styles and patterns, my go-to for winter tends to be plaid. I just love how festive it feels for the month of December as we approach the holidays. I snagged this neutral plaid scarf from Nordstrom years ago and it’s still on a constant rotation every winter. I also can’t resist classic accessories like my dainty necklace from Gigimey and accessories that make a statement like these $5 gold frames I found at H&M. 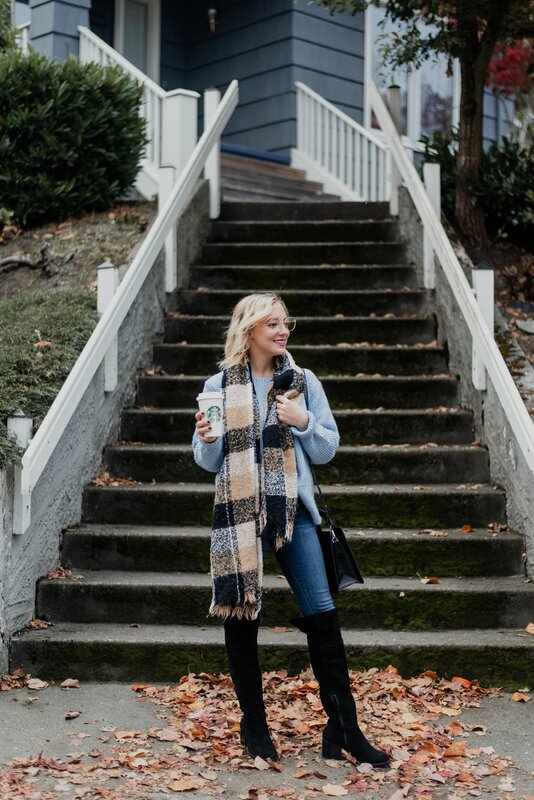 My winter outfit formula is a surefire way to make use of your favorite winter staples, stay cozy and on trend all at the same time! What is your formula for winter OOTDs? Spill the tea and leave me a comment below! *Collaboration note: Thank you Lane 201 for collaborating on this product sponsored blog post! All thoughts and opinions expressed on West Coast Aesthetic are my own and every collaboration is done with absolute integrity.